If you have a tooth that’s been decayed or subject to trauma, you need restorative dentistry services at Trust Dental Group that will improve the condition of your teeth. It’s also appropriate for those with older or worn-out restorations including amalgam fillings that need to be replaced by Dr. Cudia. A dental bridge is made up of two crowns on either side of the missing tooth connected to an artificial tooth, called a pontic, in the middle. These three “teeth” form the “bridge” that is color-matched to your teeth and then cemented into place. Teeth that have been decayed or have been subject to other forms of trauma require strengthening. A dental crown, or cap, goes over the remaining tooth structure to give it stability. Tooth-colored fillings blend in seamlessly with your existing smile. If you have a cavity that needs to be filled, this modern solution has become the standard of care in recent years. If you’re missing your upper, lower or all teeth, dentures are a simple way to regain the full abilities of your mouth. Our dentures are available in full or partial with different materials to suit your needs. Dental implants are the most advanced option available to replace one, multiple or all teeth. 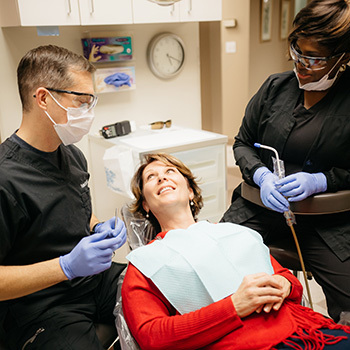 Once the implant has been placed, we’ll affix the necessary restoration safely and securely into place. When a filling isn’t appropriate, inlays and onlays may be ideal. An inlay fits within the cusps of teeth, while an onlay is larger and covers more of the tooth’s surface. Enjoy a lifetime of oral health. Contact us today to book your appointment or to learn more about restorative dentistry in Downtown Downtown Atlanta! If you’re experiencing a dental emergency, we offer 24-hour service.